Aside from that criticism being kind of odd coming from a master of TV cliffhangers, Whedon’s argument has stirred up many fans who love Empire precisely because of its dark, unresolved ending. For the second film of a planned trilogy, it makes sense to end on an ominous down note, thus setting the stakes for the third film to follow. But Whedon’s comments got us thinking: what makes for a truly great ending? 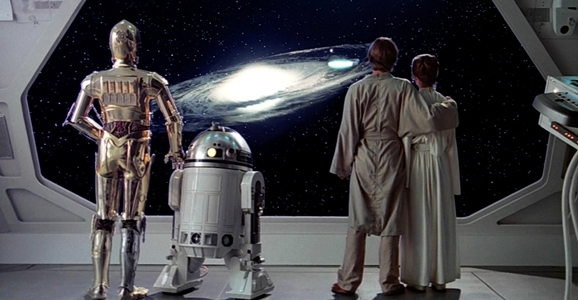 We’ll try to answer that question below, with our picks for the Ten Best Science Fiction Movie Endings of All Time. Take your pick of the first or second movie. The original is by far the most iconic, with Doc Brown returning, dressed like a lunatic, and warning Marty that they have to travel into the future because “something’s got to be done about your kids!” After just having had a blast watching Marty and the Doc’s adventures in the past, the tease of getting to see their future was thrilling. All the more so when Doc uttered the famous line, “Roads? Where we’re going, we don’t need roads.” For me, though, I love the Back to the Future II’s ending even more. It parallels the first and plays up one of the more entertaining elements of the second movie: multiple versions of the characters running amok through the timeline. It also makes the stakes more tangible. In the first movie, Marty’s kids, who we’ve never met, are the ones in trouble; in the second, it’s the Doc who needs rescuing, and we love that crazy old dude. Alfonso Cuaron’s Children of Men is a movie perpetually bouncing between hope and despair, and that holds true all the way through the film’s final moments. Theo (Clive Owen) has helped Kee (Clare-Hope Ashitey) give birth to her daughter, the first infant born in two decades, and the pair have made their way onto a small boat, hoping to rendezvous with the Human Project. As we realize that Theo has been fatally shot, there’s no way of knowing don’t know which way things are about to turn. Will Kee and baby Dylan be rescued, or will we be left with an ambiguous and heartbreaking final image of the boat alone in the fog? When the hopeful ending does finally come, Theo’s sacrifice makes it feel well earned. You can take your pick from the various cinematic adaptations of Jack Finney’s 1955 novel. I love the 1956 version starring Kevin McCarthy, a razorsharp satire of McCarthyism and Cold War paranoia. But for my money, the closing scene of the 1978 version is by far more iconic and terrifying. We see Matthew going about his day in a world where the pod people have almost completely taken over. Nancy spots him on the street and calls to him, thinking he’s still an ally. Instead, he raises a hand and emits the a piercing alien scream. The first time you see it, it’s scary as hell, and that final image has been referenced and parodied countless times since. Speaking of ending that have been riffed on for decades, this may be hands-down the most infamous science fiction movie ending of all time, and certainly one of the most iconic twists ever. Its lasting impact is no surprise the screenplay for the original Planet of the Apes was penned by none other than Twilight Zone creator Rod Serling. The guy knew a thing or two about last-minute twists, and Apes’ final moments live up to his high standards. The slow reveal of the ruined Statue of Liberty, first glimpsed as the camera passes behind the spikes on her crown, allows the emotional weight to hinge on the reaction of Charlton Heston’s marooned astronaut. The audience is given just enough time to hopefully get a dreadful sense of what is coming before the Statue is revealed in all its crumbling glory. Sometimes a great ending is solely about the final few moments before the credits roll, but sometimes it’s the lead-up to that final image that really sells it, one perfect moment following the other in close succession. In Wrath of Khan, the audience is still reeling from the sacrificial death of Spock, and director Nicolas Meyer doesn’t give us time to recover from that shock. We’re taken to Spock’s funeral, where the emotions run high and rise even higher when Kirk’s voice breaks on the word “human.” As Spock’s body is launched into space, James Horner’s version of “Amazing Grace” swells, and I am reduced to a blubbering baby. Toss in Kirk’s line, “I feel young” and Nimoy’s closing monologue and I am seriously a wreck. As it should be. A perfect example of how well an ambiguous ending can work, John Carpenter’s The Thing leaves us in the same state the characters have been in for most of the movie: uncertain and paranoid. After the bloodbath endings for most of the cast, after the nasty alien critter revealing itself in increasingly more disturbing forms, it finally comes down to a brilliantly simple closing scene: two men, sitting across from each other, unsure whether the other one is human. Kurt Russell and Keith David both nail these closing moments, regarding each other with suspicion, dark humor, and a little healthy fatalism. What happened after the credits rolled? Why don’t we just wait here for a while…see what happens. Twelve Monkeys is one of my favorite movies of all time, and it all comes down to the haunting, heartbreaking ending where Cole’s childhood memories finally gain context, and he finally catches up with himself in the saddest way possible. There are tons of different approaches to time travel. Can you change the future? Do all possibilities exist simultaneously in different realities, branching like a tree? Or, to borrow a phrase from another Bruce Willis time travel flick, is the path a circle, round and round? Twelve Monkeys opts for the latter approach, and no other film has done it so beautifully, tragically, perfectly. Unfortunately, I can’t find a full clip of the ending, so the version below will have to do. It’s a testament to director Terry Gilliam’s masterful composition that the sequence can even be watched with the sound off without losing much of its impact. What do you think? What would you add or remove from our list? Sound off in the comments! I am so glad you included “The Thing” in your list, as it was the first to come to my mind. I love the uncertainty to the ending. Great list. Huge 2010 fan, too. Great movie with a great ending. I’m also partial to the ending of Sunshine. After such a raw journey on a suicide mission, the success of the mission brought back to Earth was for me, very effective. Sunshine was an amazing film. It’s annoying that so many people completely dismiss it. That film is chock full of stuff people misinterpret. Aside from the fact that the ship has gravity, it’s scientifically sound. Dr Brian Cox from CERN actually worked on the film and does a very entertaining commentary on the DVD. Planet of the Apes was brilliant because that’s the moment when he realizes he didn’t land on another planet and can go home, he traveled into the future and is home. I thought JOHN CARTER had one of the most satisfying endings to a science fiction/fantasy that I’ve seen decades. Better than a number of the films on this list as well. What about Colossus The Forbin Project, and Escape From New York? Have you ever seen “Candyman”? I was always fond of how they ended that film. Geez.. where is Alien? TOO obvious, is it? I just didn’t like children of men (same with district 9). Felt way too preachy to me. The Thing is one of my all time faves, the reason it did badly at the box office was because it was competing with ET at the time, and as for the ending?…Who was breathing warm air out? But then again they were both sharing a bottle of scotch so if even one of them was infected then it was going to spread. My mind just bubbles with this ending. Maybe they ended up at the Russian base together? I am adding an honorable mention to iRobot. Sunny says it was Spooer on the hill for Robot salvation, but by the end it was Sunny, leaves the door open for endless speculation. I agree Sunshine had an epic ending, As did Moon. It is DAMN hard not to add Tron legacy, Prometheus, Time Bandits, the Dark Crystal. John Carter is another ending that will go down in EPICS for me. I just didnt see it coming. endings like these are to complicated for modern movie morons to digest…..ah,the death of cinema. Episode VII? That’s not out yet. Pretty sure you meant V.